Antique curtain rods for tab top curtains, eyelet curtains or pinch pleat draperies. 8 foot Smooth 1 inch metal curtain rod. Wrought iron curtain rod look. Some colors are more than base price. Stocked colors ship in 1-2 business days, custom colors ship is 5 business days. Stock Colors: Black, Antique Gold, Rust. 2 inch fluted wood pole, Wood Trends Renaissance collection. Wood drapery poles for your windows. 8 feet wide, by Kirsch. Use as swag curtain rod. Modern curtain rods. Wood drapery poles. Use as swag curtain rod. Kirsch's reputation for quality and elegance was built on Wood Trends. These classic styles in rich colors and subtle grains complement wood furniture finishes and architectural details, allowing for a totally original design statement. With a wide assortment of components such as elbow brackets, swivel sockets and holdbacks, Wood Trends is not only timely but also functional. Note: Some colors have surcharge added. Graber has extra long drapery rods for your wide window. Super heavy duty, White finish. Projects 2 to 3 1/4,inner, and 5 to 6 1/2 inch on outer, clearance 1 1/4 to 2 1/2 , innner, 4 1/2 to 5 3/4 on outer traverse rod. Includes cord tension pulley. Returns 5 3/4 to 7 inches. Graber super heavy duty window drapery rods features include a universal front loading end bracket, metal adjustable and reversible master carriers ball bearing end pulleys, a spring loaded side gate for adding or removing slides, molded, canted slides, can be converted to one way draw, scored center support base for easy mounting on narrow casings, universal cam lock stirrup, braided polyester cord, and angled tip on overlap arm. Extra long, drapery double rods by Graber. Drapery double rods. White finish. Super heavy duty Graber traverse rod and valance rod. Projects 2 3/4 to 4 1/2 and 5 1/2 inch on valance, clearance 2 to 3 1/2 inches traverse. Includes cord tension pulley. Graber super heavy duty features include a universal front loading end bracket, metal adjustable and reversible master carriers ball bearing end pulleys, a spring loaded side gate for adding or removing slides, molded, canted slides, can be converted to one way draw, scored center support base for easy mounting on narrow casings, universal cam lock stirrup, braided polyester cord, and angled tip on overlap arm. Super heavy duty window drapery rods. White finish. Projection, 5 to 6 1/2 inches, outer rod. Projection, 5 to 6 1/2 inches, outer rod. 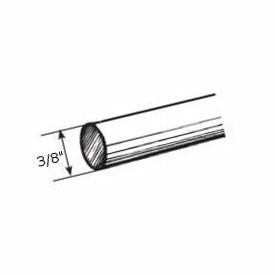 Clearance 4 1/2 to 5 3/4 inches, outer rod. A commitment to quality. Graber super heavy duty features include a universal front loading end bracket, metal adjustable and reversible master carriers ball bearing end pulleys, a spring loaded side gate for adding or removing slides, molded, canted slides, can be converted to one way draw, scored center support base for easy mounting on narrow casings, universal cam lock stirrup, braided polyester cord, and angled tip on overlap arm. Super heavy duty one-way right traverse rod 66-120"
Traverse rods 28-48" two-way draw projects 2 3/4 to 4 1/4"
Hold-tite stirrups projects 2 3/4" to 4 1/4"
Traverse sheer rod kit 28-48"
Traverse sheer rod kit 48-84"
Traverse sheer rod kit 66-120"
Traverse sheer rod kit 84-156"
End bracket projects 1 7/8"- 2 7/8"
Universal center support projects 2 3/4-4 1/4"
Projection center support 5-6 1/2"
Cord tension pulley height 5 1/2" to 7 1/2"